The cheapest car in the US today is the Nissan Versa 1.6 S at $12,780. With the new Datsun Go, the same company offers another five-seat car on the other side of the world for a little more than half the price. Would you say it's a good deal? The question is purely theoretical as the Datsun brand is not going back to the US anytime soon. So, there will be no Black Gold for you I'm afraid. 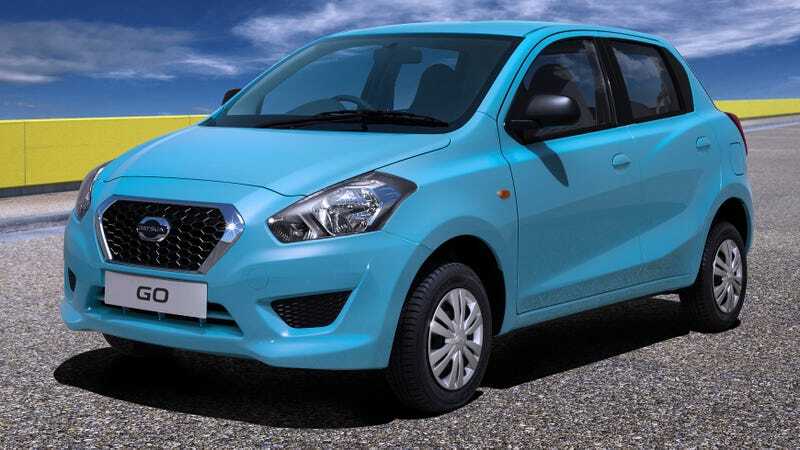 After India, Datsun will be introduced in Indonesia, Russia and South Africa. They call their target costumers the Risers, which sounds a like a post-apocalyptic motorcycle club, but actually means that the Go had to be both economical, fast at low speeds and as spacious as possible as Indian families tend to be quite big. Not to mention safety and body that can take the abuse of heavy traffic, as many Gos will be the first cars of their owners. The Go comes with the Nissan Micra's 1.2-litre gasoline engine and a five-speed manual. At roughly the same size (width – 5.36 ft; height – 4.87 ft; length– 12.41 ft and a wheelbase of 8.33 ft), it is pretty much a Micra without the fancy stuff and more practicality. Nissan is aware that although it is a five seat car, Indians will jam more people into the cabin regularly. My guess is that's why they put the handbrake on the dash and connected the front seats with some extra fabric turning it into a bench. For entertainment, Datsun will offer a mobile docking station that can connect to your smart phone. While that's an extra, Indians will get the rest for under $7,000 starting from early next year. And as the relaunched brand expands, more budget cars with appear wearing the blue badge on three continents. Hmmm, a new Datsun 510...but does the Datsun Go worth its price in your eyes?